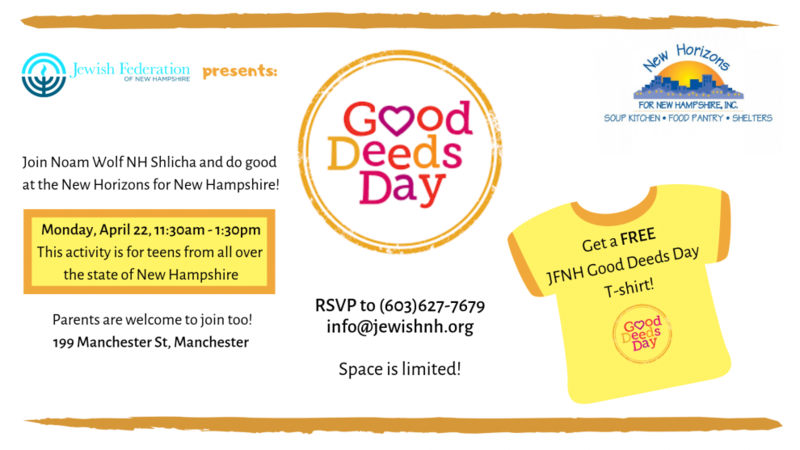 We are excited to invite you to the first of its kind Good Deeds Day in New Hampshire! Come and meet the Israeli Shlicha at the New Horizons for New Hampshire in Manchester, parents are welcome to join us too. Teens from 15 different synagogues + unaffiliated are invited to this event, come meet this unique group of people as you do good and give back to the community. Free T-shirts and other swag! 603-627-7679 or info@jewishnh.org + send me your T-shirt size.